If you’ve ever had transmission failure in your vehicle, you know how costly and complicated it can be. Luckily, depending on where your transmission is located, we might be able to isolate and complete remanufacture it — without impacting your engine. With most engine manufacturers, the transmission is located inside the engine case such that the two cannot be separated for remanufacturing. In other words, if the transmission malfunctions, it can only be remanufactured as part of our complete engine remanufacturing process. Note: we currently rebuild and remanufacture engines and transmissions for most makes and models of all-terrain vehicles, namely Honda, Polaris, Yamaha, Arctic Cat, Can-Am, and Kawasaki. In most Polaris and Can-Am units, however, the transmission is located outside the engine case. In fact, sometimes we see the transmission fail without any damage to the engine at all. In these situations, we’re able to perform a complete remanufacturing of the transmission by itself — if that’s what the customer or dealer needs. By isolating the transmission, our customers won’t have to endure a complete engine remanufacturing. At nFLOW, we’ll do whatever we can to help our customers save time and money. (1) a complete disassembly of the transmission, followed by (2) an extensive cleaning and thorough inspection, (3) replacement of worn or damaged parts*, and ultimately (4) a precise reassembly of the transmission. After this process is complete, the transmission is in pristine condition and ready for installation! 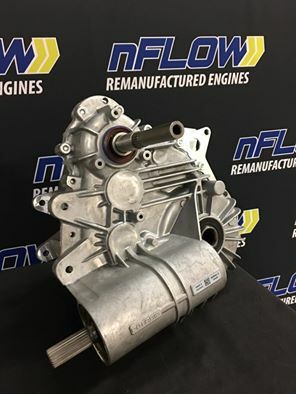 * It’s worth reminding our customers that nFLOW only uses premium quality components in its remanufacturing process. Because of our relationships and purchasing power with a variety manufacturers, we have access to state-of-the-art parts at competitive pricing. Our goal is to cut costs, not corners. Want a quote on a remanufactured transmission? Contact nFLOW today at (812) 867-0060.